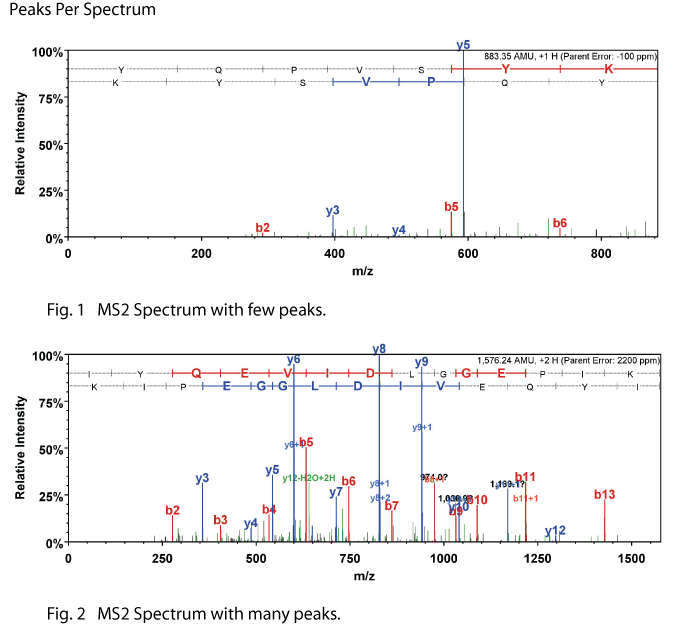 Peaks per Spectrum is the number of fragment ion peaks in the MS2 spectrum. Peaks per Spectrum gives an indication of how well the precursor ions are fragmenting. The Peaks per Spectrum metric is calculated as the median number of peaks in all MS2 spectra. Higher Peaks per Spectrum means that the precursor ions fragmented better. Low values of Peaks per Spectrum mean poor fragmentation. Poor fragmentation may be caused by a collision energy not tuned optimally. In general charge 3 and charge 4 precursor ions have more Peaks per Spectrum than charge 2 precursor ions. This means a change in the Percent +1H, Percent +3H or Percent +4H metrics may be reflected in a change in Peaks per Spectrum. Likewise larger precursor ions as measured by Percursor m/z will usually have higher Peaks per Spectrum.